Katharine is seen here conserving an original Ansel Adams gelatin silver photograph. Photographs are an invaluable part of your life. Whether precious family heirlooms or prized pieces from your collection, they deserve the care and attention of a professional photograph conservator. 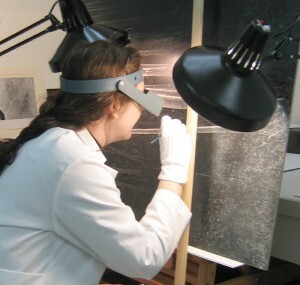 Katharine Whitman is an experienced, Toronto-based conservator, educated at Queen’s University and a prior Mellon Fellow at the George Eastman House International Museum of Film and Photography. Katharine is not currently taking on new work due to an especially heavy work load. Feel free to contact her for referrals to other qualified conservators or special projects.